In the constellation of Ursa Major (of which the Big Dipper is a part), in the crook of the tail (or bend in the handle) is a double star known as Mizar and Alcor, seen above. These stars are visually separated just enough to be distinguishable to the naked eye. Distinguishing them requires good vision, and they were sometimes used as a test of visual acuity. Mizar and Alcor are a double star, since they appear close together from our point of view. Some double stars are binary stars, meaning that they orbit each other under mutual gravitational attraction, but others are simply aligned in the same direction by chance, and can be light years away from each other. With Mizar and Alcor it is unclear whether they are also a binary system. They are similar distances from us (about 80 light years), but they are about a light year from each other, which would be quite distant for a binary system. On the other hand, they have similar proper motions (their apparent motion through the sky) which would imply they are gravitationally connected. Viewed under a good amateur telescope, Mizar is itself seen to be a double star. It was the first telescopic double star to be discovered, in 1617 by Benedetto Castelli. The two stars, known as Mizar A and B were later confirmed by Galileo. Together they form a binary system, being gravitationally bound to each other. In 1889 Edward Pickering discovered that Mizar A was also a binary star. Pickering couldn’t resolve Mizar A as a double star, but instead looked at its spectrum. The spectral lines could be observed to shift gradually back and forth toward the red then toward the blue. This shifting is due to the Doppler effect of light, where light from an object moving toward you is blue shifted slightly, and light from an object moving away from you is red shifted slightly. The oscillation of Mizar A’s spectrum from red to blue meant that it is oscillating toward and away from us over time. This is because it is in orbit with a companion star. So even though Mizar A could not be distinguished visually as a binary star, it could be observed by its spectrum. It thus marks the first spectroscopic binary to be discovered. In 1996 this system was directly observed using the Navy Precision Optical Interferometer. In 1909, Mizar B was also discovered to be a spectroscopic binary. Finally in 2009 Alcor was determined to be a spectroscopic binary as well. This means that what appears to be a double star with the naked eye actually consists of 6 stars. At least four of them form a double binary system. What makes this system particularly interesting is that it contains the history of astronomy. 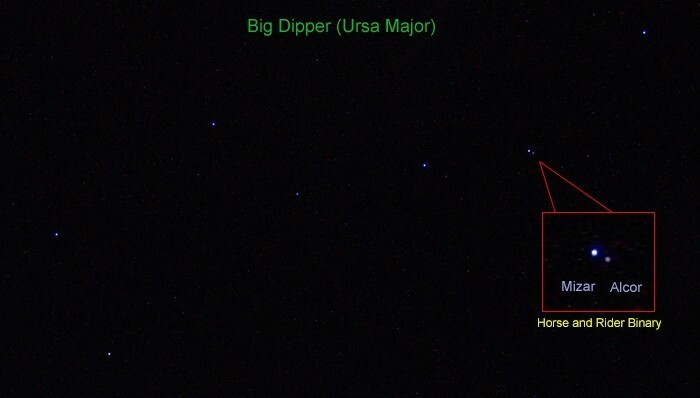 The Big Dipper is an asterism dating to early astronomy (and given several names), with a naked-eye double known for thousands of years. With the rise of telescopes Mizar is seen as a double, then with the rise of spectroscopy they are seen as doubles, and only within the last few years has a high precision array of telescopes been able to discover the third binary of the system. So when you find the Big Dipper in the night sky, look for the double star in its handle, and think upon the hidden variables it contains.